We all know at least one mom who seems to always have it together. Someone who seems to have no problem balancing work and family. Someone who never seems to get overwhelmed. The truth is though that for most of us, the challenges of a working mom are vast. Last week my husband and I had a rare day off together and went out to lunch with baby Trajan. While we were waiting for our food, we were playing with him and he started to laugh. This was the first time I had heard him laugh. I was so excited! My husband said the words that I think all working moms dread, “He’s done that before”. How did this happen? I’m his mommy. I’m supposed to be there for all of his firsts. Yet somehow he had been laughing for a week already and I had no idea. That got me thinking. How many milestones in his life will I miss? Who will get to experience them instead of me? During the first three months you will start to notice all sorts of new behaviors from your baby. During tummy time they will go from laying with their arms tucked in and their cheek down to holding up their head and looking from side to side. They will start to recognize your face and smile at you. They will start to kick and babble and everyday you’ll notice them becoming stronger and more coordinated. When your baby is between 4 and 6 months old, your baby should be reaching and grabbing more. They will also be more active with their toys during tummy time and will start trying to roll over. As they near the 6 month mark they should be rolling over on their own and also sitting up unsupported. You will be able to start experimenting with solid food and sippy cups. The biggest change during this time will be those little baby teeth coming in, so get the teething rings ready. It’s time to start baby proofing the house because your baby will be on the move soon. Between 7 and 9 months, your baby will start to crawl. They will also be sitting up on their own and working on their standing skills. 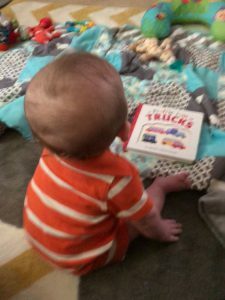 They will start picking up toys and other objects with more purpose and will also use those skills to feed themselves finger foods and wave or clap. Their babbling will also become more intentional and you may start hearing “mama” or “dada”. You will also probably find yourself playing a lot of peek-a-boo. With the end of the first year nearing closer and the birthday plans in full swing, Your baby will keep becoming more independent. They will start climbing and squatting and holding onto furniture to get from one place to another. They may even start walking on their own during this time. They will start to understand short commands and will add a few more simple words to their vocabulary. They will become more expressive with their emotions, including throwing tantrums. I had to start by letting go of the guilt. My son will never know that I wasn’t there the first time he laughed. It may feel significant to me in the moment but what will be significant for him throughout his life will be the moments we have together. I make sure the time that I get with him is full of quality interaction and development opportunities, and of course all the snuggles I can get. 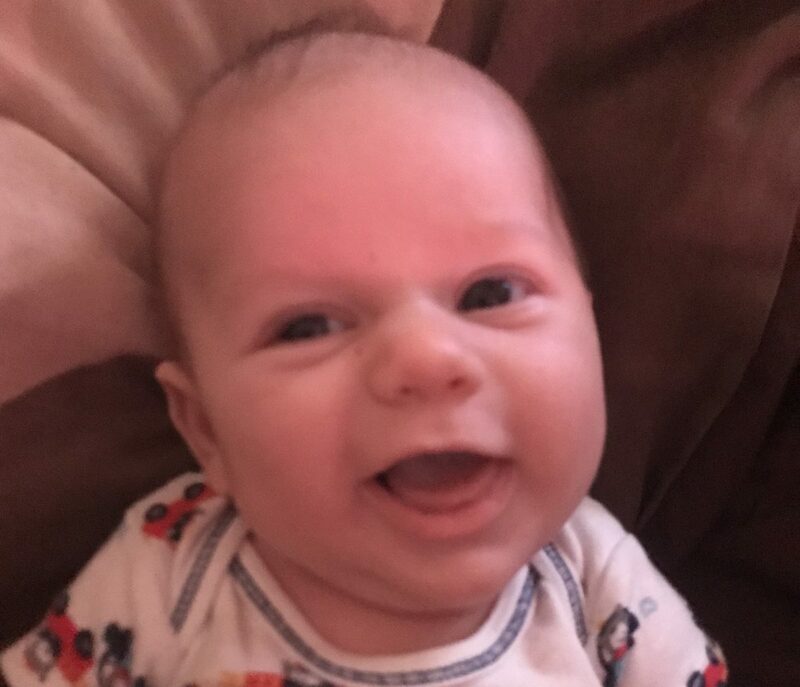 I have had to remind myself time and time again that I am doing what I have to do to make the best life possible for him. I have to go to work every day, at least for now, so that I can afford all of the things he wants and needs. I want to be able to give him the world. Lastly, I remind myself that the harder I work right now, the sooner I will be able to walk away from my fulltime job. 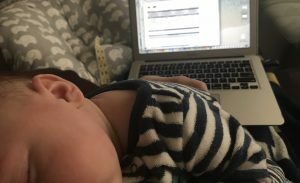 There will come a time when I will be able to make my own schedule and spend more time at home with my son, but to get to that point I need to put in the hard work right now. So many of us want the opportunity to spend more time with our babies, but not all of us are in a financial situation where we can be without income. So what can we do? 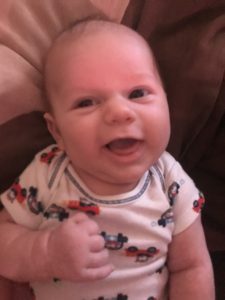 I started this blog while I was pregnant with my son, with the goal of helping people that were looking for answers and hoping for someone they could relate too. The side effect to a successful blog though is income. It doesn’t come easy, and I’m still working on it, but the ultimate goal is for blog income to replace the income from my fulltime job. As I was getting started, I came across a website that was able to really guide me in the right direction. If you have any interest in starting a blog of your own, I highly recommend checking out my review of Wealthy Affiliate. 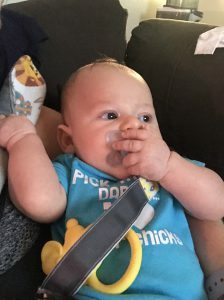 Previous Previous post: Should I Give My Baby A Pacifier?